2011 TOYOTA PRIUS. With an average of 48 mpg/city and 51 mpg/highway, the Prius led the list of most fuel efficient cars in the US market. US Environmental Protection Agency or EPA, published the list with the most and least efficient new vehicles of 2011, list that includes cars and SUVs from different segments and prices that fit the tastes of American buyers. 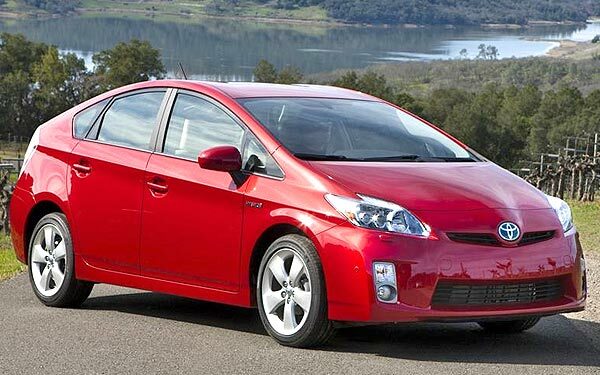 The king of money savings in gas is again the Toyota Prius Hybrid. The Toyota hybrid who led the top 10, proved with its performance of 48 up to 51 miles per gallon, why it is the most popular hybrid in the world. Ford, along with its luxury divisions, Lincoln and Mercury, have developed sedans that combine efficiency, power, technology, good design and one of the most important points, they are being sold at very low and affordable prices. These qualities put them in direct competition with Japanese cars, recognized for its high levels of performance. In the case of the Ford Fusion, Mercury Milan and Lincoln MKZ, provide in their hybrid versions an average consumption of 36 mpg in the city and 41mpg on highways. Honda Civic has become one of the best-selling cars in the U.S, thanks to its practicality and efficiency, which along with the hybrid version, may achieve from 40 up to 43 miles per gallon, but the Japanese brand is not a 'One Hit Wonder' company and has expanded its portfolio efficiently, with the Insight model, sharing the figures with the Civic. The Japanese manufacturer offers several options for those seeking an environmental clean car. Its latest model is the CR-Z SUV, which stands out for its futuristic design and appeal. Its 1.5L i-VTEC engine combined with the hybrid-electric system and automatic transmission, give it an efficiency of 35 up to 39 miles per gallon, which is amazing for being a mid-size SUV. In recent years, different brands have worked to make that, efficient cars, especially hybrids, leave their dull image, and Lexus has been one of the manufacturers which has put more effort. The HS 250h offers the same functions and performance of a gasoline car but with a consumption of 34 and 35 miles per gallon. Currently, there are efficient models for all tastes and lifestyles which also include some SUVs that, few years ago, enjoyed of popularity due to their versatility and comfort level, leaving aside its high fuel consumption. However, the global crisis and the renewed environmental awareness has pressured manufacturers to build more efficient models, and this includes family vehicles. According to EPA, the most efficient SUVs in this segment are the Ford Escape Hybrid, Mazda Tribute Hybrid and Mercury Mariner Hybrid, whose consumption ranges between 31 and 34 miles per gallon, and offer good standards power features as well as lots of comfort and value. For those with a townsman lifestyle, the best option is the Smart Fortwo. Whether in coupe or convertible version, this cute car offers many benefits. It is easy to handle, you can park it almost anywhere and save a lot of fuel as its performance ranges between 33 and 41 miles per gallon. Japanese manufacturers have distinguished by mixing shapes and functions very well, and the Nissan Altima Hybrid is a good example. In addition to a refined style and large interior spacious, it has an average consumption of 33 miles per gallon, a figure that makes it an excellent choice for those seeking the best family car with true sportsmanship. Lexus is determined to give it that touch of sophistication to its hybrid vehicles and has achieved it with no problems. In the case of the RX 450h, it offers 295 horsepower accompanied by a consumption of 28 mpg in the city and 32 miles per gallon on highways, resulting in an excellent performance and great fuel economy. To close the Top 10 of the most efficient cars, EPA chose the manual transmission version of the Honda CR-Z 2011. This mixing of the Honda Insight and the Honda Fit, serve 122 horsepower and a fuel efficiency that ranges between 31 and 37 miles per gallon.